So I am sitting here reading small is the new big and Seth Godin has a riff on Poilane my absolute favorite bakery we visited in Paris last year. 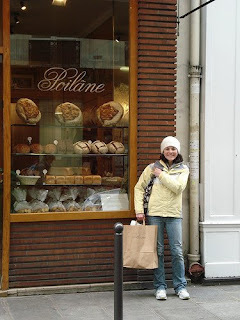 I discovered Poilane on the Martha Stewart show, and made it one of my musts on our trip. They opened the have been in business since 1932 and are passionate about their bread. The quality of their product really speaks for itself when a majority of the local restaurants serve their bread. We were lucky to visit the first Poilane and sample some of the Punitions and pastries. Can't wait to go back, but for now will have to read about them and lick my lips in antcipation! 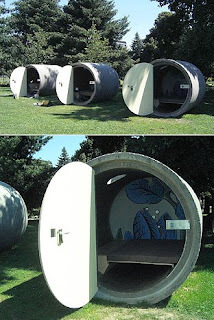 Located right on the Danube, Dasparkhotel is like beach camping without the tent. There are no restroom facilities so you have to be ninja like and use the public ones nearby (however, they do provide you with a map so you can locate them, ain't that sweet!) My favorite feature other than the design is Dasparkhotel (brain child of Andi Strauss) is the "pay as you wish" rate where customers leave a Euro amount that they can afford and with which they wish to support the project. Can we say score!? !